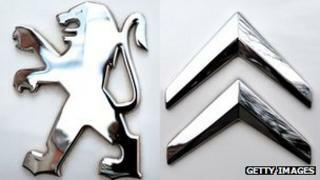 French car maker PSA Peugeot Citroen is to be dropped from France's Cac 40 blue chip index, in an embarrassing demotion for the company. Peugeot was a founding member of the Cac 40 benchmark index, created 25 years ago, but has been struggling with falling sales and a plummeting share price in recent years. The group will be replaced by Belgian chemicals group Solvay. The change is due to take place on 24 September. PSA Peugeot Citroen, Europe's second-largest car maker by volume, has suffered a 13% fall in sales in the first half of the year. And its share price has plummeted 61% over the year, while the Cac 40 index has risen by 11% over the same period. Demotion from the index could lead to a fall in the stock's liquidity when it is no longer included in the baskets of shares bought by index-tracking and exchange-traded funds. "When a stock is expelled from the Cac 40, it's like a punishment," said Christian Jimenez, president of fund manager Diamant Bleu Gestion in Paris. "It's a signal that management has failed to maintain the level of performance of a company." In July, Peugeot announced that it was cutting 8,000 French jobs on top of the 3,500 announced last year and closing its plant at Aulnay. But the loss-making company says it expects to break even by the end of 2014.